That’s an effective use of selective focus. Only the nearest parts of the closest flower are sharp, and the other flowers are mere ghosts. By coincidence, when your post came through I was playing with some selective-focus experiments of my own from two days ago. I’m fond of the selective focus look, and the way background flowers render at wider apertures. This was taken at f/4, at f/5.6 the background flowers don’t render as well. VEry nice,selective, Tom. I like just the hint of anthers peeking through the petals. No ephemerals yet, unless we are counting skunk cabbages. Thanks, Steve – I have a some other takes of groups of open flowers with anthers in full view as well. My local patch had just a few blooms, Garden in the Woods has hepatica, and a few bloodroot blooms, but the Acton conservation land site where I took this had hundreds of them. It was wonderful. Maybe I should drive over to Acton soon. The bloodroot season is short! Better go soon. Lovely shot! Mine are doing really well, the colony spreading out all over my garden. I’m assuming they can handle the 5 inches of snow we got yesterday…. Thanks, Melissa! You’re lucky – my backyard bloodroot plantings didn’t come back after a couple of years. Hope the snow melts soon! Oh, no, they didn’t? Mine have spread out a bit, but I notice they aren’t in some of the places they were last year. I’d hate to lose them. I lost my native columbine very quickly. If you do I hope they persist for you. What a beautiful photo, in so many ways: the focus, the grouping, the purity of the white blooms. The name rang a bell, and when I looked it up, I found that, although uncommon, the species is present in the woods of deep east Texas. I suspect I’ve missed them this year: perhaps even by a month or more. I may try to get to that area soon, and if I do, I’ll keep these in mind. It was such a blessing to see and photograph these flowers. Thanks for the kind words about the photograph. 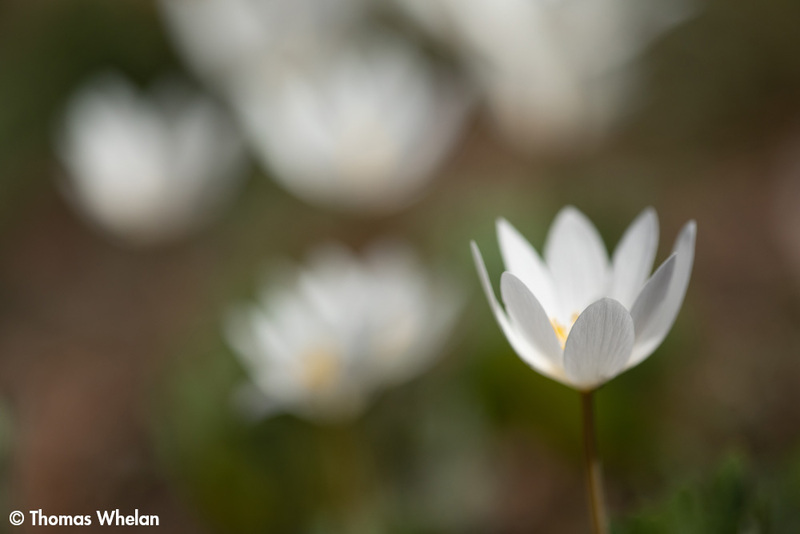 You probably will have to wait until next year to find bloodroot in Texas – they are among the earliest wildflowers up here. Best of luck finding them!